For the past few months, I CANNOT stop thinking about Lemon Meringue Pie. And it’s taken every ounce of discipline I have to keep myself from to the nearest Marie Callender’s and buying one. 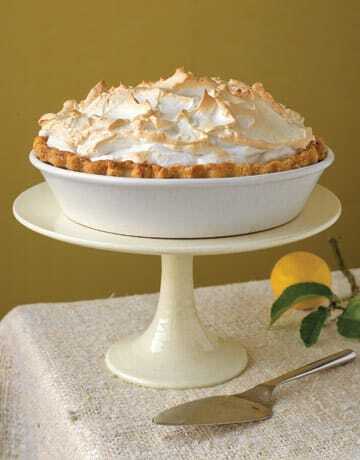 Even though lower in PointsPlus than most other pies, a slice of Lemon Meringue can still rack up the PointsPlus. The average slice has around 12-15 PointsPlus. Not exactly crazy, but definitely not a bargain. But by making a few small, healthier changes in a traditional lemon meringue pie recipe, I was able to trim off a few Points, making each serving of 1 slice, just 8 Points. Not bad for a dessert that truly tastes rich and decadent (this isn’t a pie made with Splenda and Fiber One, people!). Most of the other low calorie lemon meringue pie recipes I found online just sacrificed too much flavor, and/or used a lot of artificial sweetener, which I am not a fan of. When I want pie, I want PIE….not something that tastes like chemicals served on cardboard. When the taste is good, it makes me feel satisfied, and I’m less likely to go eating something else because my need for fabulous pie wasn’t met. So, if you are looking for a tasty, yet much more Weight Watchers friendly pie recipe for dessert this weekend, give this one a try, and enjoy the light & lemony flavors — they are HEAVENLY! This delicious, low calorie pie recipe is much more Weight Watchers friendly than most other pies out there. It’s fresh, lemony, sweet, and full of all the deliciousness that you’d expect from a traditional Lemon Meringue Pie Recipe, but with just 8 Points per slice. Not a bad bargain for such a decadent dessert. To make crust: Set oven rack at lowest level; preheat oven to 425°F. Stir together flour, 1 tablespoon sugar and 1/4 teaspoon salt in a medium bowl. In a small bowl, combine the melted butter and applesauce. Slowly stir this mixture into the flour with a fork until the mixture is crumbly. Gradually stir in enough ice water so that the dough will hold together in a ball. Press the dough into a flattened disk. Place the dough between two sheets of plastic wrap and roll into a circle about 12 inches in diameter. Remove the top sheet and invert the dough over a 9-inch pie plate. Remove the remaining wrap. Fold the edges under at the rim and crimp. Line the shell with a piece of foil or parchment paper and fill with pie weights or dried beans. Bake for 10 minutes, remove the weights or beans, and continue to bake until the crust is golden, 8 to 10 more minutes. Cool the pie shell on a rack while you make the filling. Reduce the oven temperature to 350°. To make filling: Whisk together 1 1/4 cups sugar, cornstarch and 1/4 teaspoon salt in a medium heavy saucepan. Gradually whisk in boiling water. Place the saucepan over medium-high heat and bring to a boil, whisking constantly. Reduce heat to medium-low and cook, stirring, for 1 minute. Remove from the heat. Whisk together lemon juice, zest, egg substitute and 1 egg white in a small bowl. Whisk a small amount of the hot mixture into the egg mixture, then whisk this mixture back into the hot sauce. Return to a simmer over medium heat, stirring, then cook for an additional 30 seconds. Stir in the butter until melted and pour into the baked pie shell. Set aside while you prepare meringue. To make meringue: Beat 3 egg whites in a large bowl with an electric mixer on medium speed until frothy. Add the cream of tartar and pinch of salt and beat at high speed until soft peaks form. Slowly add 1/2 cup sugar, beating constantly, until the mixture holds stiff, shiny peaks. Spread the meringue over the hot filling, sealing to edge of crust. Make attractive peaks with a metal spatula, knife or the back of a spoon. Bake until the top is lightly browned, about 15 minutes. Cool the pie on a rack until it is room temperature, about 2 hours. The filling separated after cooking and turned the crust into a runny mess :( flavor was good, though. In a word…WOW! Thanks for this and ALL of your amazing recipes!!!! Your site is one of my favorites! Can the sugar be substituted with splenda in order to reduce the points? It certainly can, though the taste and texture would be pretty different.